Cannes may be still abuzz with the roaring engines of George Miller’s "Mad Max: Fury Road”—a joyful act of kinetic overkill that provided a tingly morning jolt to members of the press—but there’s also a quieter fare playing here that can be no less thrilling in its own unassuming way. Whereas the Main Competiton kicked off yesterday with Matteo Garrone’s "Tale of Tales,” an interesting if uneven rumination on the theme of loss and disenchantment, today saw the opening of a side section called Un Certain Regard, which is nominally a second-string competition, but sometimes offers films to rival the quality of those officially vying for the Golden Palm (as was the case with such fare as Alain Guiraudie’s "Stranger by the Lake” and Ruben Östlund’s "Force Majeure”). 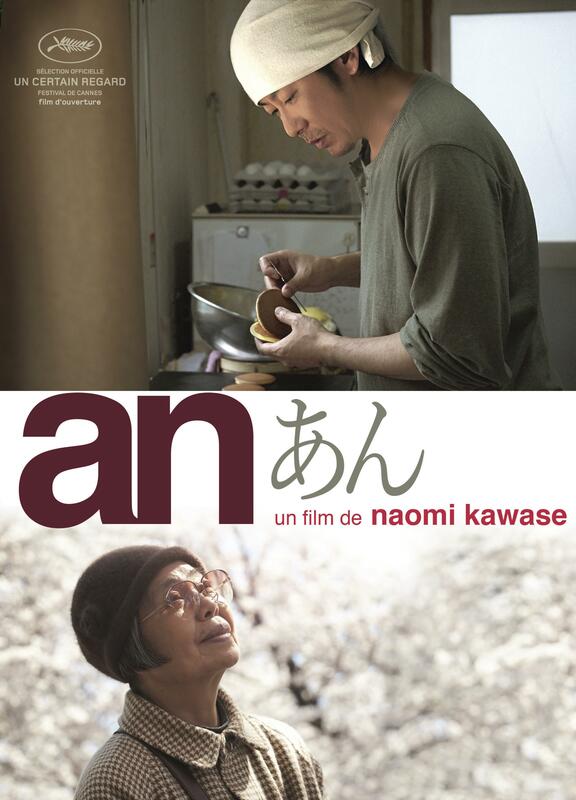 This year’s opener of the section was Naomi Kawase’s "An," a cloyingly sentimental yarn of an elderly pastry chef transforming lives around her through the magic she does with the titular pancake filling. Kawase is a long-time Cannes darling and I may be alone in my emotional immunity to her films, but it needs to be said that this particular one feels extremely calculated in its effort to become an arthouse version of the popular inspiration-through-cookery genre that gave us "Babette’s Feast” and "Chef” at its best, and "Chocolat” and "Eat Pray Love” at its worst. Formally speaking, the film’s inoffensive simplicity suggests finger-painting, and offers about as much sophistication in terms of character development and theme. Also, to this foodie’s disappointment, Kawase doesn’t try to come up with a way of filming food preparation itself that would seem appropriately loving and sensual. Instead, we end up literally staring into a simmering pot of beans for much of the film’s running time, while the main character (rather bullyingly) brings good cheer to everyone she meets—especially her grumpy boss, whose dislike of sweets is an all-too-easy shorthand for the chronic unhappiness from which he suffers. Much more accomplished is "One Floor Below,” Radu Muntean’s excellent and much-awaited follow-up to "Tuesday, After Christmas”, the 2010 festival hit that remains one of finest achievements of the so-called New Romanian Cinema. Just like in his previous features ("Summer Holiday,” "The Paper Will Be Blue” and "Tuesday…,” all co-written by Alexandru Baciu and Razvan Radulescu), at the center of "One Floor Below” is a male character under moral pressure, entangled in a thickening web of self-delusion while striving to preserve some sort of control over his life. As played by the immediately likable (yet consistently cryptic) Teodor Corban, the main character here is a middle-aged man of the family breaking a social rule and trying to cope in the wake of his deed. The story’s set-up has a near-Hitchockian clarity that positions the film immediately as a purposeful variation on "Rear Window”. We first see Patrascu jogging at a park with his dog and trying to stick to his diet (his belly clearly shows, but so does his determination to lose it). Upon returning home, he overhears a violent neighborly row and decides to neglect it. Soon after, he learns a murder has been committed in the apartment the argument took place in—however, when the policeman comes knocking, Patrascu decides to withhold information about what he had witnessed. This single decision comes as a surprise early on in the film and is left unexplained by the script, which is why I suspect "One Floor Below” will win fewer fans among Western cinephiles than "Tuesday,” which also implicated the audience in the main character’s double-dealing, but since the latter was merely adulterous in nature, the viewers might have found themselves a bit more forgiving (or at least understanding). Here, what we witness amounts to a blatant violation of one’s civic duty, and in order to understand it, one cannot forget that the main character is very much a product of an era of communist rule in Romania. His reluctance to aid the police in the investigation is as clear a sign of his personal fear (he suspects he knows who the murderer is and he doesn’t want the guy to be after his family) as it is of his alienation from society at large, still marked by the aftermath of Ceauşescu’s morally draining regime. The film doesn’t state any of this outright and instead weaves the argument into the script very subtly: we see how easily corruptible the state clerks are at a licence plate workshop, then witness the main character tentatively approaching the police only through a personal friend who happens to work in the force (old habits die hard: in most communist countries, the only way of assuring something got done was to have a member of the family work in some official capacity). All this comes wrapped in a suspense scenario: Muntean’s signature device is a long take of an ostensibly innocent conversation, usually focused on technicalities in a specific field (dental care in "Tuesday”, computer equipment in "Floor”), with a subtle tension mounting due to viewers being privy to the characters’ hidden secrets. By stretching those moments in time, Muntean not only builds palpable tension, but also shows the length his characters are willing to go in order to avoid confrontation with the truth and maintain illusion of order in their lives (this very delusion may be, in fact, his favorite subject). As I was watching the film, I admired how subtle it is in portraying a man whose sense of social belonging and responsibility has been destroyed almost totally by the authoritarian political system he grew up in. At the same time, I feared that the way of articulating the subject matter may be too offhand and subtle for it to fully register with audiences that haven’t grown up (as I have) within the former communist block. The key to appreciating "One Floor Below” is to keep in mind that it takes place in a country still troubled by its past—just like the son of the main character proves to be troubled by chaotic, video game-fueled dreams in the film’s last, strangely comforting scene that is as close as Muntean gets here to articulating something akin to hope.